HJ: The world cannot be transformed through the same level of consciousness that created the problems it is experiencing. However, by shifting to a higher level of consciousness, mass healing can begin. But this kind of higher consciousness is much more profound and deep than simply choosing to meditate everyday or practice yoga everyday or eat healthy. This requires a fundamental shift in our internal consciousness — our approach to life and more specifically each other. I won’t spill the beans here as Lissa does a great job in her article below describing one of the core components of the shift in consciousness that is needed at this time. You can’t change something by making it wrong. You can only effect change if you can wake up the sleeping people, and in order for them to hear you, you must have compassion for how they got where they are. Think of all the truly effective change agents. They didn’t come out with hate, guns blaring and voices screaming. They came out with love and spoke to the hearts of those who knew there was another way. That’s my intention with medicine. Many people are angry at medicine because our system is so broken. I used to be too. But the establishment can’t hear you if you’re beating them up. They’ll defend against you, even if you speak the truth. The only way to get them to hear you is to love the very people who are out of alignment, with a universal truth. Then, feeling loved and safe, they have the opportunity to release their defenses and examine their own beliefs and actions and choose whether they’ll come with you or dismiss what you’re teaching. If they don’t choose to come with you, it doesn’t mean they’re wrong. We live in a very dualistic world, in which you’re considered either right or wrong, awake or asleep, north or south, our side or their side, and we place judgments on all those positions. But we need to release the judgments. We all have our own paths. If you’re trying to change people who aren’t ready to change, release them without anger. It just means their souls are not yet ready for what you are inviting them to do. No need to be angry. Bless them and carry on. May you find the angry part of you, the part that feels violated and betrayed, the part that should have been nurtured, but instead was harmed, the part that is making others wrong, the part that is frustrated because you know the truth and nobody else is listening to you, the part that just can’t stand the discomfort of being with the truth when others don’t yet have it. Offer that part of you comfort, loving care, and compassion. Promise to take care of that part of you. Make a commitment to always listen to this angry part. Promise to never sell out that part of you. Never. Ever. Reassure the angry part. Mother the angry part. Soothe the angry part. The angry part thinks it won’t get heard unless it screams, defends, and makes everyone else wrong. The angry part doesn’t trust that it will be heard if it shows up in love. It doesn’t realize it’s actually sabotaging your efforts to effect change, because you can’t change something when you make it ‘wrong’. But I promise, there’s a more effective way to teach. I know this may feel impossible for many of you – and that’s okay – but if you’re ready, when the angry part calms down, do a loving kindness meditation focused on all the people who aren’t changing, the ones who aren’t listening to you, the ones who hurt you, the ones who disrespected you, the ones who aren’t ready to face the truth that you know. Know that they were hurt too, that they have an angry part within them that they are not acknowledging, that they are defending against you and your truth because of this angry part that they’re trying to protect. Because they’re not nurturing their own angry part, the angry part keeps acting out, hurting others. I know it’s hard, but try to open your heart to love those who hurt you. Have compassion for them, for they were hurt as you were. Pray for help if you think you can’t forgive. Then, with that in your heart, go out to those who aren’t listening if it is your path to do so (it’s okay if it isn’t). Teach what you’re hear to teach, but not from a place of agenda or dogma, not with righteous anger and indignation, but with an invitation to see the light. Model another way, without attaching to whether or not they choose to see the light with you. Then, from a place of non-judgment, you can illuminate universal truths and inspire those who seek to join you in knowing the truth, while releasing those who choose not to hear you. Would You Be Willing to Show Up Differently? 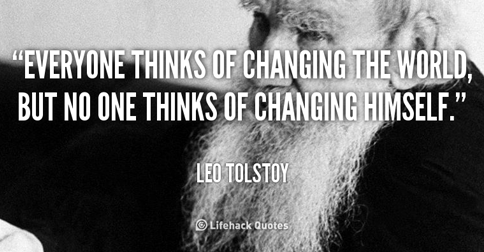 What do you hope to change? What are you making wrong? What are you righteously angry about? Is there any way you could shift so you show up with love, compassion, and non-judgment for the sleeping people instead? Lissa Rankin, MD is a mind-body medicine physician, founder of the Whole Health Medicine Institute training program for physicians and health care providers, and the New York Times bestselling author of Mind Over Medicine: Scientific Proof That You Can Heal Yourself. She is on a grass roots mission to heal health care, while empowering you to heal yourself. Lissa blogs at LissaRankin.com and also created two online communities – HealHealthCareNow.com and OwningPink.com. She is also the author of two other books, a speaker, a professional artist, an amateur ski bum, and an avid hiker. She lives in the San Francisco Bay area with her husband and daughter.